The joint budget for Justice and Public Safety for the upcoming fiscal year entails a 3.5 percent increase to the original JPS budget passed by state lawmakers last year. Despite unmet needs in North Carolina such as re-entry services for ex-offenders returning into local communities, little progress is made beyond funding for pay raises and one-time bonuses. Under the joint budget, state support for higher education – the UNC System and Community College System – fails to ensure that adequate resources are available to provide quality education services to the more than 400,000 students enrolled in public colleges and universities across the state. The joint budget includes a new fixed-tuition payment option that would guarantee that tuition does not increase during a specified time period for future students attending public four-year universities within the UNC System. The joint budget also limits the amount of revenue raised through student fees at public four-year universities each year. While these actions aim to address the cost of college, they fail to ensure that North Carolina’s four-year public universities have the resources required to ensure quality education services. Steady erosion of state support for higher education in recent years has played a direct role in the increasing cost of college in North Carolina. Tuition at community colleges has increased by 81 percent since 2009. At public four-year universities, state funding per student remains more than 15 percent below its 2008 pre-recession level when adjusted for inflation – equating to hundreds of millions of dollars in funding cuts. This pressing reality is unaddressed in the joint budget negotiated by lawmakers. State leaders are on a relentless pursuit to radically change the state’s tax system to rely more and more on the sales tax, while working to eliminate the income tax. This tax swap is necessary, they say, to address the volatile nature of the income tax. What it means is that there will be a heavier tax load for middle and low income North Carolinians. This is an approach to taxation that will likely create more problems than solutions. Volatility refers to how the level of revenue collections is affected by what’s going on in the economy. Good economic times mean higher levels of overall tax revenue, while economic downturns typically result in state revenues plummeting. The strength of revenue collections, however, can be a product of both the business cycle and the design of the tax system. North Carolina’s current tax code is underperforming historic growth rates (see Gov.’s FY17 budget, Page 33), which could be a result of tax changes passed in recent years that have resulted in a flat income tax, for example. A report by the Center on Budget & Policy Priorities highlights reasons that a tax swap—greater reliance on sales tax and less on income tax—will not only fail to address volatility concerns but also can generate additional problems. While income taxes typically fall more steeply than sales taxes when the economy enters a recession, the reverse is also true: income taxes rise more rapidly than sales taxes during periods of economic growth. Taking both periods of growth and decline together, only income taxes increase enough to fund normal expenditure growth and meet the evolving needs of residents and businesses. Sales taxes do not. 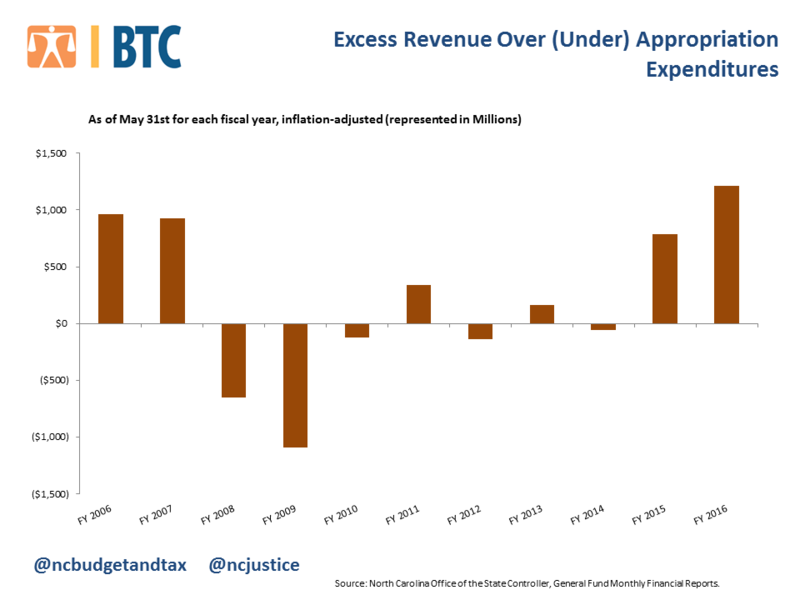 Eliminating the income tax won’t protect North Carolina from revenue losses in downturns. States without income taxes—Florida and Nevada for example—were among the hardest hit in the Great Recession. Most experts recommend a balance across various sources of revenue to offset the competing sensitivities and contributions that each can make to a revenue system seeking to achieve stability, equity and long-term adequacy. Most fundamentally, North Carolina Senators proposal to eliminate the income tax would require policymakers to find other sources for more than half of the revenue that the state currently collects. A proposal that will likely lead to further erosion in the state’s commitment to public investments that help families, seniors and communities thrive. Moreover, it is a solution that is unnecessary given the better tool of a Rainy Day Fund to address volatility—one that state leaders have committed to aggressively. And while the timing and pace of state leaders’ contribution to the Rainy Day Fund now raises concern, it is clear that a responsible Rainy Day Fund policy, relying on a mix of state taxes that include an income tax and not restricting tools to generate revenue at the local level, are ways that can help address and manage volatility. Shifting to greater reliance on the sales tax and eliminating the income tax will not give North Carolina the flexibility it needs to change with the ebb and flow of the economy. It will only shift the tax load and undercut the state’s tax code’s ability to achieve a core responsibility of funding the services that support thriving communities. State leaders continue to talk out of both sides of their mouths when it comes to their supposed tax reform efforts. In one breath, lawmakers scold the decision to temporarily increase the sales tax rate in the wake of the Great Recession, which caused revenue collections to plummet. In the very next breath, however, state leaders laud their desire to steadily increase the amount of sales taxes North Carolinians pay as a transformative, game-changing move. How can they praise the very action they supposedly disavow? This demonstrates why state leaders cannot be trusted regarding tax policy decisions they’ve pushed through in recent years and their stated plans going forward. Their rhetoric doesn’t align with their inconsistent actions. State leaders have made it explicitly clear that they would like to make radical changes to North Carolina’s tax system. Their goal is to shift our tax system to rely more and more on sales taxes while working to eliminate the income tax. This tax swap does not bode well for most North Carolinians and jeopardizes the ability of our tax system to provide adequate resources to ensure that all communities can thrive. Hardworking middle- and low-income North Carolinians are particularly harmed by this tax swap, as they pay a larger share of their income in sales taxes. So the more they are asked to pay in sales taxes, the less income they have to make ends meet. Income tax cuts largely benefit the wealthy and powerful corporations, so continuing to cut income taxes means giving more and more tax breaks to well-off households. Since 2013, lawmakers have delivered nearly $15,000, on average, in tax cuts for millionaires, while hardworking middle-income North Carolinian have received just $6, on average, each year. Meanwhile, low-income North Carolinians who struggle the most to put food on the table and keep the lights on have received a $30 tax increase, on average. The fact that this tax swap harms middle- and low-income families and individuals while greatly benefiting the wealthy and powerful has not stopped state leaders from ushering it in. In fact, it seems to embolden them to charge forward even faster. The claim by state leaders that all North Carolinians have benefited from their tax swap efforts in recent years is more of their talking out of both sides of their mouths: Giving large tax cuts to the wealthy and powerful is a good thing. Raising taxes for lower income North Carolinians is good. And somehow all North Carolinians benefit. This flawed logic cannot be trusted.